A couple of posts ago, I talked about this plan view conceptual vs. the other example posted. I discussed the pros and cons of each and added a few other thoughts. This was the one that was chosen for the project. The client liked the possibility of students being able to interact between the seating areas available to them. They also liked the collection of trees on the other side and the overall feel of the courtyard. The important thing for any designer to remember is that given the task of defining space with a lot of people and traffic—give them a space for “community”, allow them space for interaction and possibility. 1. Seating — and lots of it. 2. 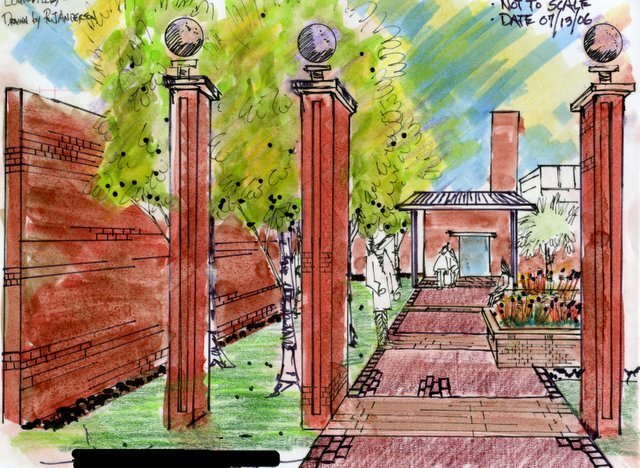 Focal points to congregate — around-steps, platforms, statuary, tree-planters. 3. Trees, trees, trees — for all the obvious reasons and the fact that trees provide a sense of enclosure. 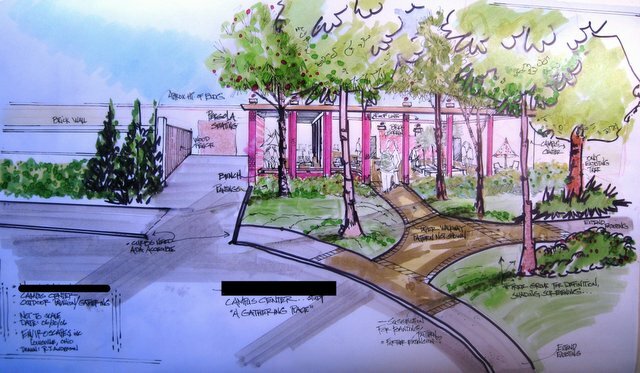 This color rendering also helped seal the deal. 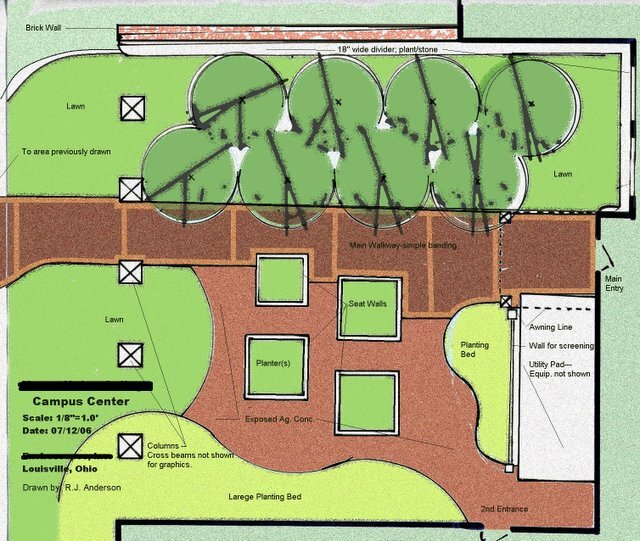 Although I personally think this is a technically bad drawing, it does speak to how the space could look. In the construction layout, we are looking at 16-17 feet between the walkway and the brick wall on the left. They are still talking about 8′ high; I hope that is scaled back to 6′ or so. That wall is important as it screens off the service/delivery dock. Anything less than a solid wall would kill the feel of the plaza space. When I speak about technically poor, I am referring to the way I used color here, and the heavy hand with the color. Ahhhh, a black and white line drawing. This is my kind of landscape rendering. The stage shown is the step before the color drawing. There were 4 trash drawings before this one. Each drawing builds upon the last. When I finally get to a place I like, the drawing is then done in a style that is presentable to the client. To the laymen out there, this is a one-point perspective drawing; one of the simplest styles to use and because it is simple, it is effective and powerful as a design tool. I was trying to give the observer a view from just outside the threshold entrance to the plaza, to show how it would look upon entering the area. All other renderings of the entire space had the observer standing in the street or halfway up the hill – about 100 feet from where we are now standing. This rendering is a reminder to also show the scene outside the plaza area. I posted these drawings a couple of weeks ago and there are a few more to go along with it. This tells the story of what the observer would see coming down the street or coming to the plaza area from the football stadium. The trees are not only here for all the obviously good reasons, but there is a lot of equipment on the roof of that building which these trees will screen away. 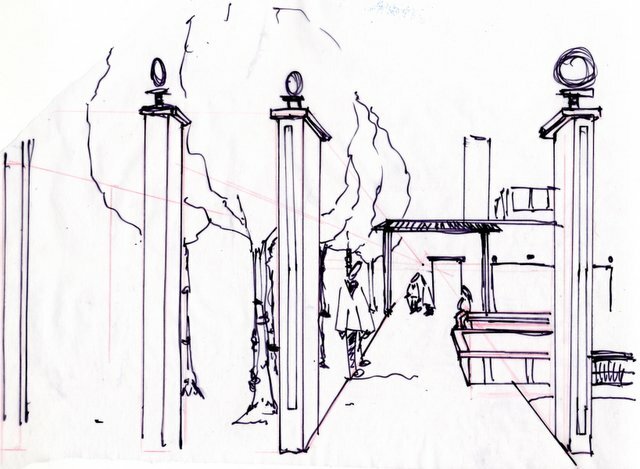 It was these drawings, along with some others, that have cemented an agreement between the contractor and the client. There are changes that will be made, and tweaks along the way, but the concept, the feel, the flow, will remain. To be sure, some enthusiastic choices about plant material, spacing, etc. remain. The project starts later this summer and is to be completed around the 1st of September. I will post pictures and we’ll see how close the concept came to reality.